Denver cyclists gathered at the Denver City and County Building to launch Denver's B-cycle Bike-Share on April 22 (Earth Day). They rode the shiny new red Trek bikes in a bike parade. Photo via ColoradoDaily.com. In 2005, with the launch of Vélo’v in Lyon, a global bikesharing movement began. By 2007, Paris began a similar bike-share with 10,000 bikes, and quickly doubled that number due to high demand. That same year, Barcelona initiated its bike-share system, Bicing, with 200 bikes; they had 6,000 bikes by 2009. Sure, bike-share programs might be an easier sell in European cities: distances are shorter and fuel is more expensive, and most cities already have strong biking cultures. But if Mexico City and Montreal can do it, why not Memphis and Miami Beach? While it’s tough to imagine the United States reaching European standards, “We can do a lot more than we do here,” said Rob Atkinson, who chaired a congressional commission to recommend alternative approaches to funding transportation infrastructure. Fortunately, more and more U.S. cities seem to agree with Atkinson. Since D.C. just revealed the name of its new bike-share service, we’re taking a look at what we hope is just the first wave of a national bike-share revolution. When D.C. and Arlington County recently asked residents to choose their top three of seventeen potential names for the area’s revamped bike-share program, “George” got the most first-place votes. But D.C. and Arlington County officials chose Capital Bikeshare to brand the new program, which will allow users to pick up a bike in the District and return it as far as Arlington, and vice-versa. To justify this decision, officials pointed out that when second- and third-place choices were counted, Capital Bikeshare ended up with 512 total votes versus George’s 423 out of 1,164 votes. Capital Bikeshare will open in the fall, with 1,100 bikes at 114 solar-powered stations (100 in D.C. and 14 in Arlington). Bixi, the Canadian Public Bike System Company that began in Montreal in 2009, will provide the bikes and the stations. D.C. and Arlington’s choice to use Bixi is representative of a larger global trend away from ad-based bike-share system providers like ClearChannel and JC Decaux, two of Europe’s largest service providers. ClearChannel, which was SmartBike’s provider, was very focused on advertising and was reluctant to expand beyond 100 bikes unless D.C. allotted further public ad space to subsidize the program. By contrast, Bixi’s business is bikes. The Bixi system focuses on building healthier and more sustainable urban communities. This model, which Bixi shares with other systems like B-cycle (a partnership between Humana Inc. and Trek Bicycle Corporation), represents tough competition for ad-based bike-share services like ClearChannel. Still, Capital Bikeshare bikes will look familiar. According to the District Department of Transportation, the Bixi bicycle has many of the same features as Smartbike: 3-speed, internal hub gears, fenders, chain guard, lights, and a front rack. Capital Bikeshare will be operated by Alta Bicycle Share, a U.S.-based company that manages, operates and provides consulting on bike-share systems around the world. In the meantime, Denver’s B-cycle bike sharing system and Minneapolis’ new Bixi service, NiceRide, have set a high standard for bike-share programs nationwide. B-cycle launched in Denver in April 2010, with more than 400 bikes at 42 solar-powered stations around the Mile High City. And Denver’s program is taking off. Denver Chamber of Commerce Board Members even rode the snazzy red bikes to their meeting last week. Other city commuters save money by taking the bikes, whose rental fee is lower than gas expenses for many residents. 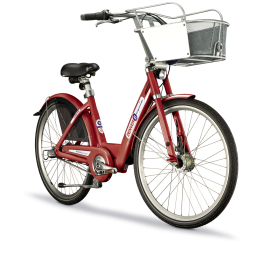 B-cycle's signature red bikes each have a basket to ease transporting things during a commute or shopping trip. Image via news.cnet.com. The bikes are free for up to half an hour. They cost $5 for 24 hours; $20 for 7 days; $30 for 30 days; or, residents can pay a $65 annual membership fee and ride the bikes as they please. B-cycle membership features a personal account page to track total miles, carbon offset, calories burned, money saved, and trip details. And a new iPhone app lets all users record their usage, find the nearest bike station and check availability. B-cycle is only in Denver, for now, but plans to expand, just as Bixi expanded from Montreal. Their B-cycle site allows residents of different cities to lobby to bring B-cycle to their neighborhoods. And recently, Broward County, Florida chose B-cycle to launch a similar program there. 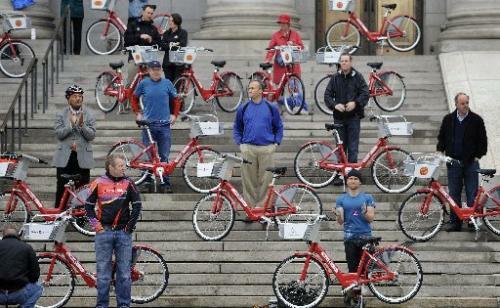 Denver first experimented with a bike-share program using 1,000 bikes during the 2008 Democratic National Convention. The pilot program was a huge success and inspired Denver’s investment in B-cycle. While the Democrats convened in Denver in 2008, Minneapolis hosted the Republican National Convention and tested a similar bike-share program. In just eight days, the pilot program logged 7,523 bike rides covering 41,724 miles. So Minneapolis decided to invest in a permanent, large-scale bike-share system, too. Last week Minneapolis launched NiceRide, taking over as the nation’s largest bike-share program. Like D.C. and Arlington, Minneapolis also chose Bixi to provide its equipment. NiceRide already has 700 bikes at 65 kiosks around Minneapolis, where users can swipe a card, take a bike, and ride off. A yearly membership costs $60, and the $5 for 24-hour rental fee is the same as in Denver. Microchips installed in the bikes make sure riders are held responsible for missing or damaged cycles. So far, most of NiceRide’s lime-green kiosks are concentrated around downtown, the University of Minnesota campus, and popular dining spots. Because of Minnesota’s brutal winters, the bikes will only be available from April through November. Miami Beach is set to launch a very similar service, Decobike, in August, and this one should stay open year-round. The program’s website features pictures of sculpted, sunbaked Miamians riding bikes in their beachwear. Decobike's website features sculpted South Beachers pedaling gleefully. Photo via Decobike. For $15 a month, Decobike will offer members a “BeachPASS,” which will give them access to bikes at any of the 100 solar-powered DecoStations throughout the City. Enrollment for Decobike will begin in July and the bike-sharing will start in August. As Capital Bikeshare gets ready to launch, cities across the country – including Portland, Boulder, Philadelphia, New York and Boston – will be watching D.C., Denver and Minneapolis closely, to learn how to do a bike-share right. So let’s show the rest of the country just how successful and sustainable these services can be. Tags: bike-sharing, Capital Bikeshare, cycling, Denver, Miami, Minneapolis, SmartBike, Washington, D.C.